FRAMINGHAM – Thursday afternoon, November 8, undefeated Framingham High will battle undefeated Natick High in a freshmen football battle at Natick High School. Kickoff is at 3:45 p.m. The game was originally scheduled for November 16, but was moved. Both teams are 9-0 this season. Framingham opened the season defeating Stoughton High, on the road, 40-28. Framingham went up 2-0 when they defeated Belmont High’s freshman 42-0 on the road. The Flyers made it three road wins in a row, when they defeated Braintree High 30-8. 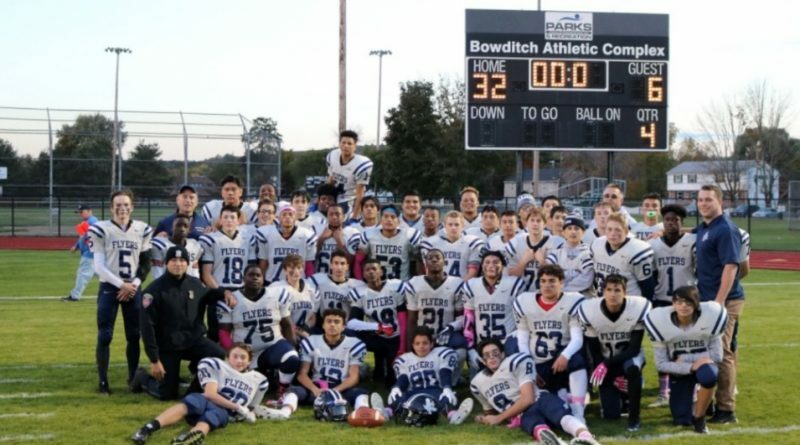 On Sept 28, Flyers freshmen defeated Braintree on the road 24-0, to go 4-0 on the season. Framingham freshmen earned their first home win in game five, against Newton North. Flyers won 28-6. Framingham then defeated Weymouth High at home 38-0, for their sixth victory of the season. The Flyers defeated the Raiders of Wellesley High 32-6 for their seventh win. Framingham defeated Walpole High, on the road, 38-19 to go 9-0 on the season.